This topic discusses how to view and manage apps and service instances associated with a space using Apps Manager. To perform the following steps, you must first log in to Apps Manager with an account that has adequate permissions. See the About Permissions topic for more information. On the space page, click the app you want to manage. You can also search for an app by entering its name in the search bar. 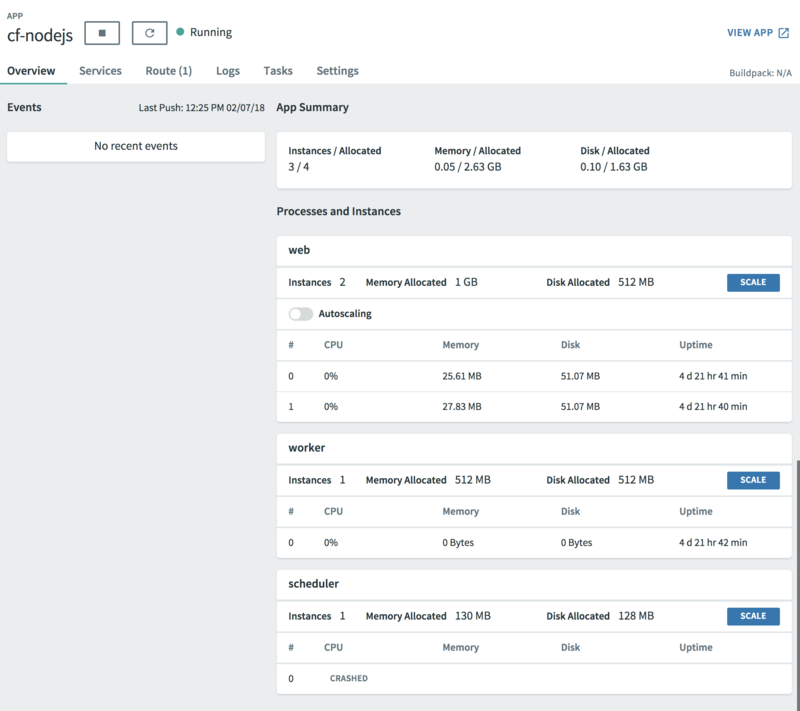 From the app page, you can scale apps, bind apps to services, manage environment variables and routes, view logs and usage information, start and stop apps, and delete apps. Restage an app Click the (restage) button. For more information about starting, stopping, and restaging apps, but with the Cloud Foundry Command Line Interface (cf CLI), see Starting, Restarting, and Restaging Applications. 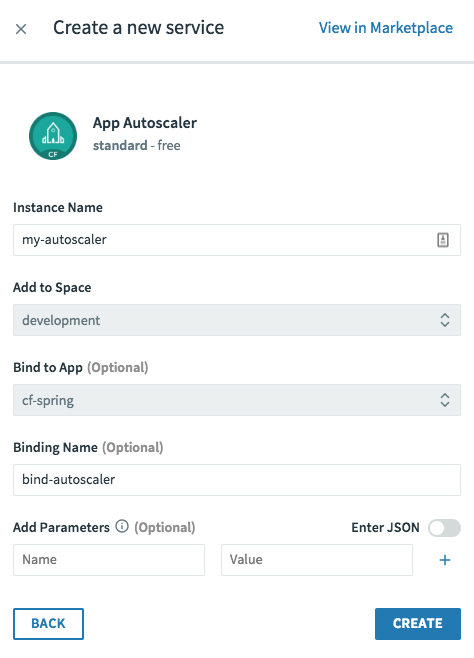 From the app Overview pane, Space Developers can scale an app manually or configure App Autoscaler to scale it automatically. Click Scale to open the “Scale App” dialog. Adjust the number of Instances, the Memory Limit, and the Disk Limit as desired. 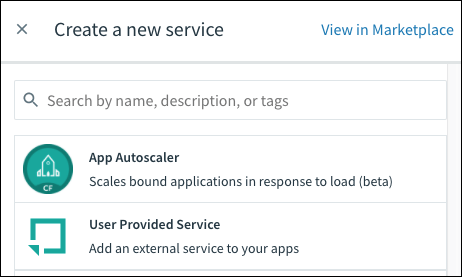 Use Autoscaling to enable App Autoscaler. 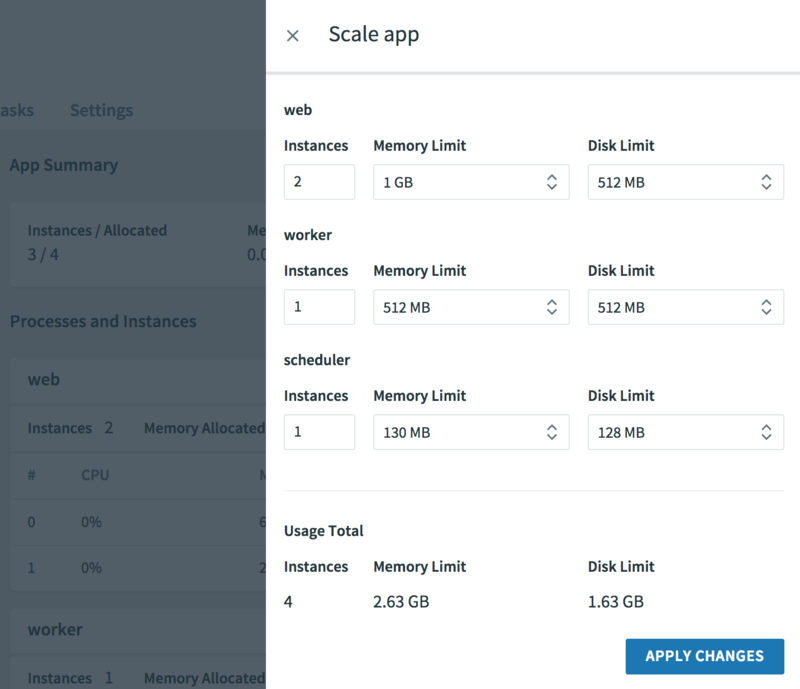 Click Manage Autoscaling to open App Autoscaler. 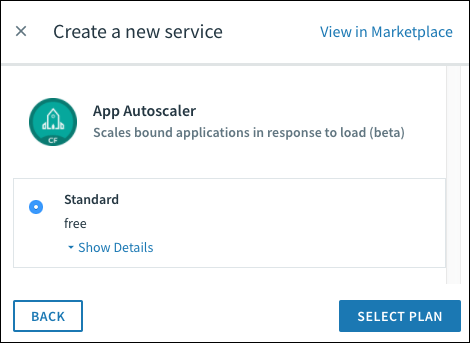 See the Configure Autoscaling for an App section of the Scaling an Application Using Autoscaler topic for how to configure your App Autoscaler to scale automatically based on rules or a schedule. Note: For services that use asynchronous bindings, Apps Manager displays the status of the service while the bind is still pending. Asynchronous bindings provide more flexibility for services that require additional time before returning a successful bind response. To bind your app to a service, click Bind Service. Under Service to Bind, select the service instance from the dropdown menu. (Optional) Enter a binding name under Binding Name in all lowercase letters. For example, bind-usr-serv. (Optional) Specify additional parameters under Add Parameters. Note: If you prefer to create the new service instance in the Marketplace, you can click View in Marketplace at any time. Select a plan and click Select Plan. Under Instance Name, enter a name for the instance. (Optional) Enter a binding name under Binding Name in all lowercase letters. For example, bind-autoscaler. (Optional) Specify additional parameters under Add Parameters. For a list of supported configuration parameters, consult the documentation for the service. 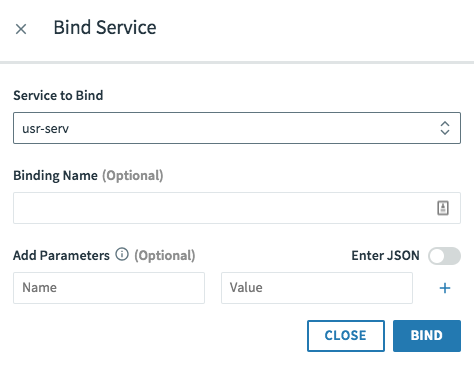 To unbind your app from a service instance, locate the service instance in the Bound Services list and click the three-dot icon on the far right. Select Unbind from the dropdown menu. The page displays the routes associated with the app. To add a new route, click Map a Route. Enter the route and click Map. To unmap a route, locate the route from the list and click the red x. Click Unmap in the pop-up to confirm. Container networking policies enable app instances to communicate with each other directly. 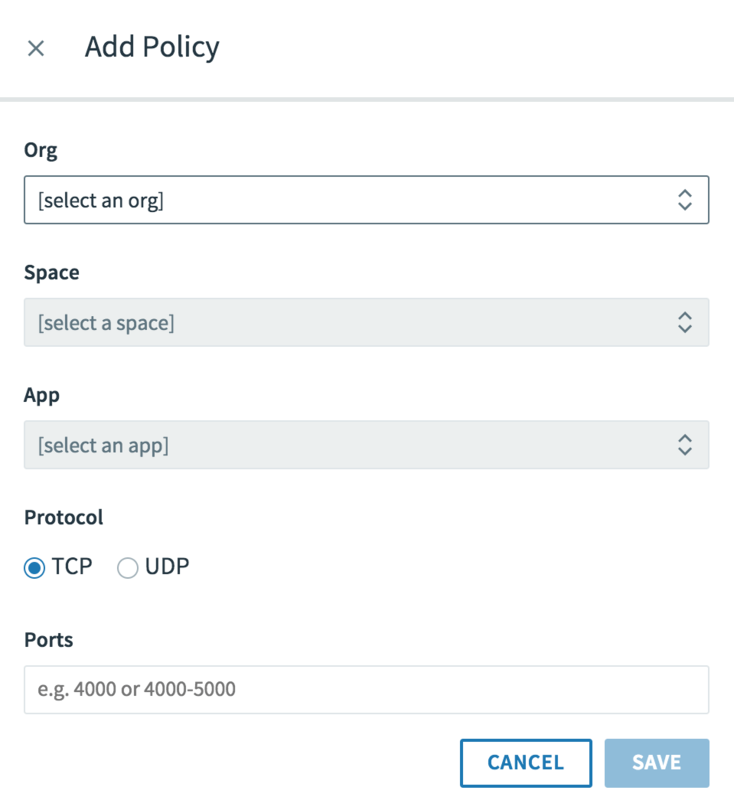 You can create container networking policies in the Networking tab. To view and use the Networking tab, you must have either the network.write or network.admin UAA scope. If you do not see the Networking tab, request one of the above scopes from your PCF administrator. Click Networking. The page displays any container networking policies associated with the app. To add a new network policy, click Create Policy or Add a network policy. For Org, select the org of the destination app. For Space, select the space of the destination app. For App, select the destination app. For Protocol, select TCP or UDP. For Ports, enter the ports at which to connect to the destination app. The allowed range is from 1 to 65535. You can specify a single port, such as 8080, or a range of ports, such as 8080-8090. For more information about container-to-container networking in PCF, see Container-to-Container Networking. Click Logs to view the logs for the app. Click the play button to view a live version of the logs. Click the Tasks tab within Apps Manager. This page displays a table containing Task ID, State, Start Time, Task Name, and Command. Click Run Task to create a task. (Optional) Enter a Task Name. In the Tasks tab, click Enable Scheduling to bind the PCF Scheduler service to your app. For more about the PCF Scheduler, see Scheduling Jobs. Navigate to the Tasks tab. Click Create Job to schedule a task. 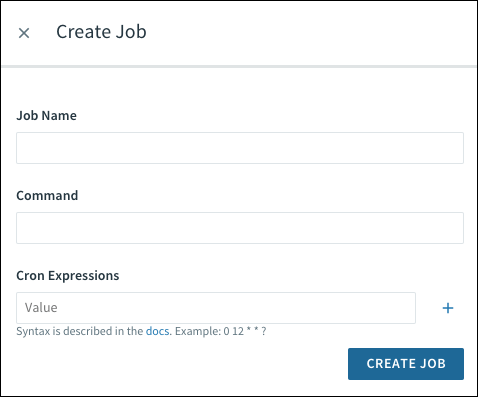 Enter one or more Cron Expressions for your desired task schedule or schedules. See Schedule a Job for more information on cron expression syntax. View information about the buildpack(s), start command, and stack. View or add Environment Variables associated with the app. Add metadata to the app. View the Application Security Groups (ASGs) associated with the app. Delete the app. When you click Delete App, you also have the option to delete the app’s routes. In the Health Check section, click the Type dropdown and select port, http, or process. Depending on which option you select, additional fields may appear. Complete the fields that appear with your selection. For port, optionally complete the Invocation timeout (seconds) field. For http, complete the Endpoint field. Optionally, complete the Timeout (seconds) and Invocation timeout (seconds) fields. For process, there are no additional fields. For more information, see the Using Application Health Checks topic. Click Reveal User Provided Env Vars. Enter the Name and Value of the variable. Alternatively, enter your variable using the Enter JSON toggle. To view all environment variables, click Reveal Env Vars. Note: Changes to environment variables, service bindings, and service unbindings require restarting the app to take effect. You can restart the app from the Apps Manager or with the Cloud Foundry Command Line Interface cf restage command. You can add metadata, including labels and annotations, to apps and spaces using Apps Manager. For more information about adding metadata to spaces using Apps Manager, see Managing Orgs and Spaces Using Apps Manager. For more information about adding metadata to objects in PAS, see Using Metadata. Click the Settings tab of the desired app. For Labels, provide a name and value pair. Or, select Enter JSON to enter the label in JSON. For Annotations, provide a name and value pair. Or, select Enter JSON to enter the annotation in JSON. To add more labels or annotations, click + next to the Labels or Annotations field. From the Services tab on the space page, you can bind or unbind apps, bind or unbind routes, view or change your service plan, manage service keys, and rename or delete your service instance. For services that use on-demand brokers, the service broker will create, update, or delete the service instance in the background and notify you when it finishes. From the space page Services tab, click the service instance you want to bind to an app. Click Bind App. A popup appears. In the Bind App popup, select the app you want to bind to your service instance. (Optional) To attach parameters to the binding, click Show Advanced Options. Under Arbitrary Parameters, enter any additional service-specific configuration. From the space page Services tab, click the service instance you want to unbind from an app. Locate the app under Bound Apps and click the red × on the right. An Unbind App popup appears. From the Overview tab, you can share your service instance across spaces. You can also view and delete service instances. From the Overview tab of your service instance, click Share Service Instance. 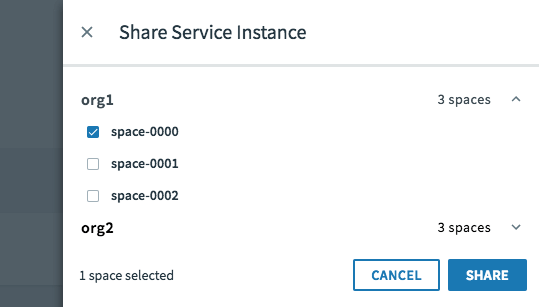 Select the spaces you want to share your service instance with. From the space page Services tab, click the service instance you want to view or change the plan for. Review your current plan information. To change your plan, select a new plan from the list and click Select This Plan or Upgrade Your Account. Note: Not all services support upgrading. If your service does not support upgrading, the service plan page only displays the selected plan. From the space page Services tab, click the service instance you want to rename or delete. To change the service instance name, enter the new name and click Update. To add configuration parameters to the service instance, enter the parameters in the Name and Value fields and then click Update. Alternatively, enter your configuration parameters using the Enter JSON toggle and then click Update. To delete the service instance, click Delete Service Instance. Note: The service broker supports creating, updating, and deleting service instances asynchronously. When the service broker completes one of these operations, a status banner appears in Apps Manager. Follow the steps below to update an existing user-provided service instance. You can create a user-provided service instance from the Marketplace. For more information, see the User-Provided Service Instances topic. Click Configuration. This tab only appears for user-provided service instances. Enter your Credential Parameters, Syslog Drain Url, and Route Service Url, and click Update Service. On the space page, click Services, then click the service instance that you want to manage service keys for. This directs you to the service instance Overview page, where you can generate a new service key, get the credentials for a service key, and delete a service key. Follow the steps below to generate a service key. In the Service Key Credentials section, click Create Service Key. Edit the Service Key Name. (Optional) Click Show Advanced Options. Under Arbitrary Parameters, enter any additional service-specific configuration in the Name and Value fields. Click Create to generate the service key. Follow the steps below to view the credentials for a service key. 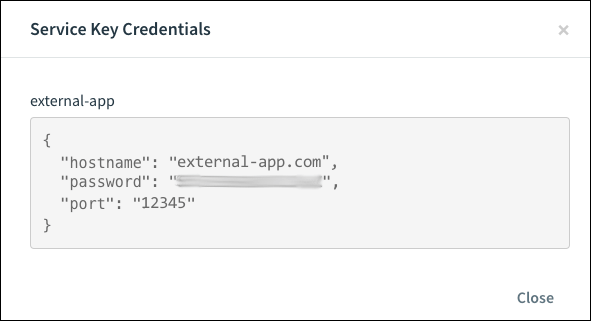 To view the credentials for a particular service instance, click the service instance name under Service Key Credentials. The JSON object containing the credentials appears. To delete a service key, click the red x next to the service instance name. For more information about route services, see the Route Services topic. 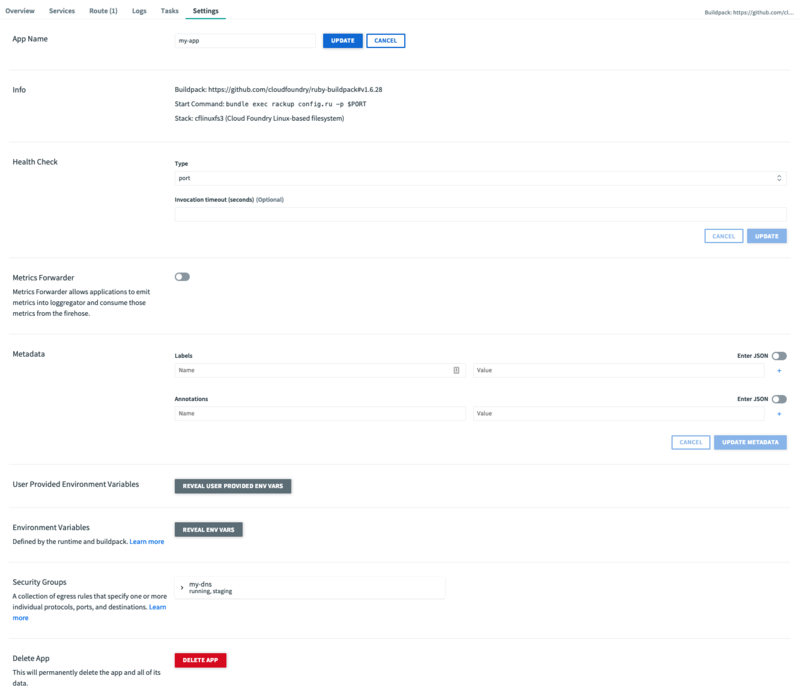 You can bind a new service instance to a route when creating the instance in the Marketplace, or you can manage route services for an existing service instance on the service instance page. Follow the steps below to bind a new service instance to a route. Select the service from the Marketplace. Under Bind to Route, either bind the service instance to an existing route or click Create Route to create a new custom route. Note: You must choose a Marketplace service compatible with route services for the Bind to Route field to appear. 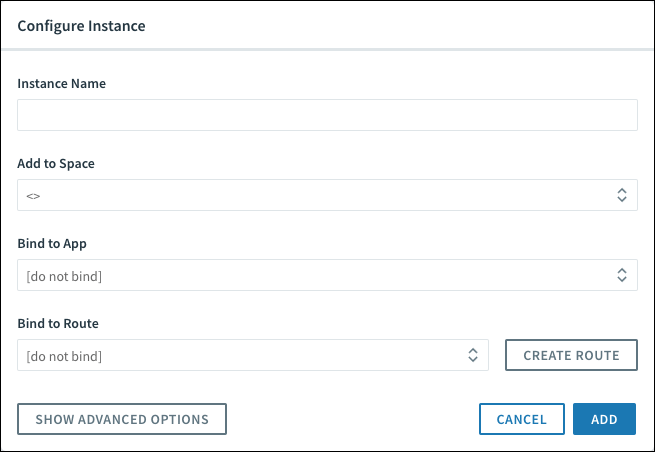 Complete the remaining fields and click Add to create the service instance. Follow the steps below to bind an existing service instance to a route. On the space page, click Services. Click the service instance that you want to manage route services for. Note: If the service is not compatible with route services, the text “This service does not support route binding” appears under Bound Routes. To bind the service instance to a route, click Bind Route. Select an existing route under Select a route to bind or enter a new route under Create Custom Route. 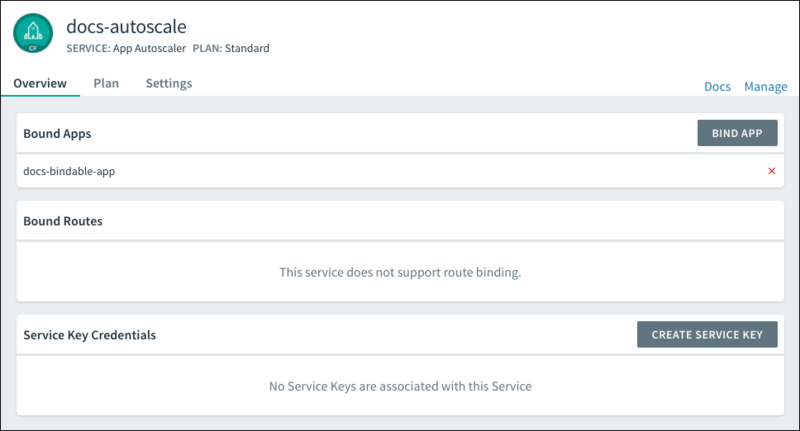 To unbind a route from a service instance, click the red x next to the name of the route under Bound Routes.